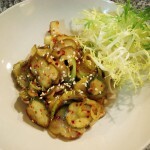 I’m introducing Korean style salty cucumber pickles (oijangajji). Unlike Western cucumber pickles, oijangajji is seasoned with a lot of other condiments and spices, which makes it good for side dishes. 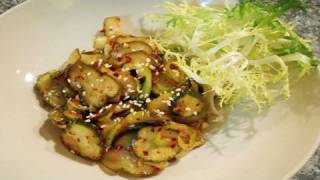 After we make the pickles I’ll show you how to make two side dishes that use oijangajji. When you choose cucumbers, make sure they are firm and the skin of the cucumbers is dark green, so that it will be crunchy when they are made into pickles. Wash and drain 5 pounds of cucumbers. In a large pot put 9 cups water, 1 cup salt, and 1 cup vinegar. Remove the cores from two small apples. Slice the apples thinly and put them into the pot. Stir the pot of brine and apple slices with a wooden spoon until the salt on the bottom of the pot has dissolved. Bring to a boil over high heat for about 40 minutes. Let the pot sit until the brine cools down. Move the cucumbers into a glass jar and pour the brine over the cucumbers. Drain the cucumbers by pouring out the brine into a pot. Boil the brine again for 10 minutes to sterilize it. Turn off the heat and let the brine cool down. Pour the brine into the cucumbers and refrigerate it. Ok, let’s make two kinds of authentic side dishes with oijangajji! Slice 2 cucumber pickles thinly and put them into a mixing bowl. Add 1-2 ts of hot pepper flakes, 1 clove of minced garlic, 1 tbs chopped green onion, 2 ts chopped green chile pepper, ½ ts honey, and ½ ts sesame oil. Mix well with your hand. Transfer to a serving bowl and sprinkle ½ tbs roasted sesame seeds. Slice 2 pickled oijangajji thinly and put it into a glass bowl. Add 1 clove of minced garlic, 2 ts vinegar, 1 ts hot pepper flakes, 1 ts salt, 1 tbs chopped green chile pepper, 1 tbs chopped green onion, 1 tbs chopped red bell pepper or red chile pepper, 1 ts honey, and combine it with a spoon. Add 1 cup purified water, 7-8 ice cubes , and mix it. Posted on Thursday, August 20th, 2009 at 5:36 pm. Last updated on October 5, 2014. Posted January 21st, 2016 at 2:01 am | Log in to reply. Hello! I am making oijangajji for the first time this week. I don’t have pictures yet, but I just put the jar of pickles in brine in the fridge. It’s taken me many years to get up the courage to do this, Maangchi! Thank you for keeping up the inspiration and encouragement! Posted April 11th, 2015 at 9:22 pm | Log in to reply. I just had some friends over for dinner, none very familiar with Korean food. This recipe for oi jangaji muchim was everyone’s favorite part of the meal. When they were done eating, they all gathered around the iPad to watch Maangchi videos while I cleaned up. So, now there are 4 new Korean food fans. Posted April 12th, 2015 at 8:37 am | Log in to reply. Posted November 1st, 2013 at 10:13 am | Log in to reply. After a week, do I throw away the brine? Or should I leave the cucumbers in the brine till I eat them? Will it get too salty? Thank you! Posted July 14th, 2013 at 7:26 pm | Log in to reply. Maangchi – Im trying to make some of the pickles. I have two jars, but when I reboiled the brine after 24 hours I lost a bit of it due to evaporation/spilling. Now on my second jar the tops of some of the tops of the pickles are not fully submerged in the brine. Will this ruin the pickles or should they be alright? Posted November 26th, 2012 at 3:34 pm | Log in to reply. I don’t know if you remember but when we met in Amsterdam, I told you that I was wondering if the salt in the oijangajji recipe was normal table salt or not as for me it was way too salty. So I made more oijangajji but with 1/2cup of salt and it turned out better for me. She explained me that as it is eaten with rice, it has to be really salty. Posted November 26th, 2012 at 7:57 pm | Log in to reply. I was going to email you after coming back from my Gapshida trip last year but never had a chance. If you don’t use enough salt in oijangajji it will turn out soggy. I was going to email you about it but never had a chance. Do you remember I had a small notebook where I wrote everybody’s names and email addresses? I just looked you up. I noticed that you’ve been posting all kinds of beautiful Korean food photos on my website these days, but I never knew it was you! Posted November 9th, 2012 at 4:13 pm | Log in to reply. I tried making this but the pickles came out too salty. Can I dump some of the brine out and then add more water to the jar to make it less salty? I took the pickles I sliced already and soaked them in water, but I don’t want to do that every time I make this banchan. Posted November 10th, 2012 at 5:03 pm | Log in to reply. If you add more water, the cucumbers may get soggy. If it’s too salty, as you said, soak sliced cucumber in cold water, and squeeze out excess water before combining with seasonings. That’s what I’m doing. Posted November 6th, 2012 at 6:27 am | Log in to reply. Hi there. I was wondering, if I could use Lebanese cucumbers to make this side dish. Posted November 28th, 2011 at 6:44 pm | Log in to reply. Hi, I have a question, What kind of vinegar we should use? The rice wine one? or just the normal one? Posted November 28th, 2011 at 7:50 pm | Log in to reply. I usually use apple vinegar but it doesn’t matter. You can use any type of vinegar. Posted November 22nd, 2011 at 12:53 pm | Log in to reply. Does it matter what kind of apples to use for this recipe? It looks like you used Fuji apples. And, if you don’t already know it, you are wonderful! Thanks for all your hard work!!! Posted November 28th, 2011 at 7:52 pm | Log in to reply. This recipe was originally posted on August 20, 2009 at 5:36 pm by Maangchi. It was last updated on October 5, 2014. The video was watched 210,452 times on YouTube & has 1,395 likes!